It is no secret that I am a fan of Snyder. Perhaps I simply have a weakness for action directors who have a distinct voice in the genre, which also explains my being a Bay-apologist. Despite this, when this movie was announced with Snyder at the helm, I was of two minds. I was excited to see action finally befitting of the character but also worried, as I had hated Snyder’s last film “Sucker Punch”. My worries didn’t stop there as Goyer penning the script was quite the mixed bag. This man has written some of my favorite comic book films- Blade, Blade II, the Crow (though this one is horribly unfaithful), and aided in the writings of the Dark Knight trilogy. He has also written some of the worst- The Crow 2: City of Angels and Blade III as well as some genuinely bad original films- Jumper, and the Unborn. And I loved it. It’s a masterful film filled with some of the most sublime action sequences to ever grace the blockbuster. However, that is not to say that this film is merely saved by its action, it has many more virtues than that. Yet even if the action was ALL there was to take away from it, it would still give it a passing grade from me, but I’ll get to that later. It’s been a couple of days since I watched it and I still have not been able to decide whether this is a blockbuster made like an art film or vice versa. I doubt it matters because the point remains the same: This film has far higher ambitions than virtually everything else in the comic book/super hero genre. The only films in this genre that I can think of that even aspire to accomplish filmmaking on this level are the Nolan Batman films and while I love these movies, there are many ways in which “Man of Steel” is superior. I must first get the most obvious of Snyder’s virtues out of the way and discuss the visual aestheticism of the film. It is gorgeous. 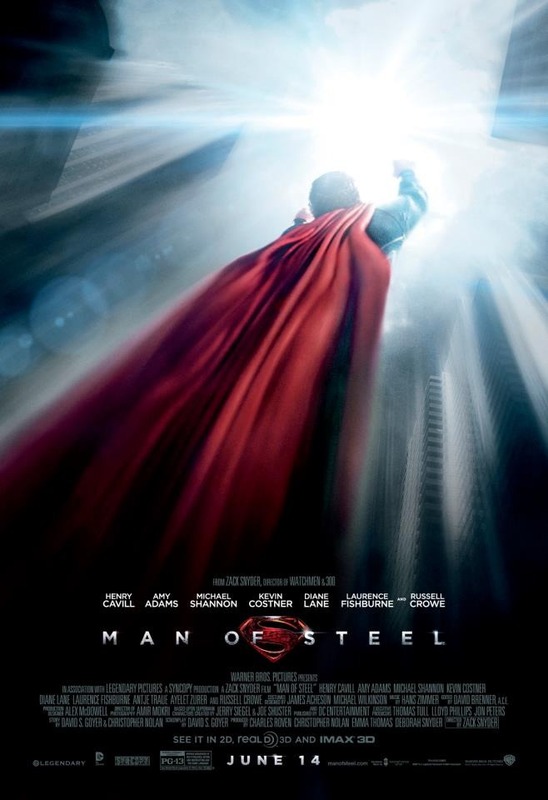 The de-saturated and grainy look of the film coupled with Snyder’s choice of often employing (or at least the illusion of it)hand held photography, quick zooms, and a shallower depth of field than most blockbusters create a cinema verite style that lends the film a level of authenticity that is completely lacking among its peers. These simple choices work wonders in emphasizing the power of superman. As we swoop through the sky following Superman he will often blast ahead of us, forcing a shift in focus then a quick zoom. We feel Superman’s power because it’s so great we struggle to capture him on film. Yet Snyder does, and that’s what differentiates this film from other blockbusters that attempt to employ this filmmaking technique in recent years. Snyder captures everything in a clear and comprehensible manner, despite the kinetic nature of the filmmaking. In this regard, the film distances itself from the criticism of “Bay’s Superman”, as Bay is (well, was as Pain and Gain and TF3 broke this rule) is a prime offender in poorly employed “shaky cam” in capturing his action. The first Transformers film is incomprehensible and denies of the visual splendor we want because of poor shot choices and lousier editing. Speaking of editing, this is the first aspect that pulls Man of Steel ahead of Nolan’s films. Along with Snyder’s inclination towards shot choice, it is often ignored that he longs for fluidity. Despite his proclivity for speed ramping and slow motion, an interest that is completely absent from this film, he pushing for a seamless sequence. Nolan’s films, despite great attention to detail and a lovely amount of intercutting, are filled with continuity errors and mistakes. A tumbler will land upside down and be right side up in the next shot. It’s a sloppiness that is at a dearth in this film. MOS is also edited far differently than your average blockbuster. It fluctuates back and forth with a natural ebb and flow, building it’s plot while going back to the defining moments of Clark’s childhood. Once again, I must bring up that this doesn’t feel like what we are accustomed to in a comic book film. On paper, it is structurally similar to Batman Begins but on celluloid (or was this digitally filmed? I should have looked that up…)it feels far more akin to the works of Terrance Malick than it does Nolan or Bay. It is not always successful with these flashbacks as some are overwrought (Goyerisms are inescapable) but it is never as weighed down as the endless “fear” conversations of Batman Begins and is more ambitious in personal in its story than Iron Man. The writing is mixed. At times, its transcendent of the genre and others it’s painfully shackled to incongruous “comic booky” on the nose dialogue and overtly convenient plotting. It does, however, make sense. It doesn’t demand you fill in any blanks or puzzle you about a contradiction. It has some laziness and oddities. I could easily nitpick these to death but that would be missing the forest for the trees. Even more problematic in this criticism is that I would have to hold other comic book films I love under the same level of scrutiny and many are far less flattering than MOS under that light. “The Avengers” is so rife with conveniences (Hulk showing up, getting bonked on the head cures mind control, the staff that does everything the plot needs) yet it’s qualities so far outweigh this similar laziness or silliness that I can’t help but adore that film. It is the same here, yet MOS has tremendous heights and not nearly as low of lows. In regards to characterization, it’s far and away the best Superman film. This is the first time I ever felt that Lois was a great investigative journalist. She ceases to be the damsel in distress she’s so often depicted as (with or without attitude). This was a very refreshing portrayal and Adams is a fine actress that imbues her with a vulnerability that gives her hard nosed attitude a sense of dimension. This is true of many of the characters throughout. On paper, they are serviceable. Through allowing an excellent cast to embody and make these characters their own, they truly come to life. Many people talk about how they can’t believe how much they cared for the characters that Kevin Costner, Russel Crowe, Diane Lane, Christopher Meloni and Lawrence Fishburne played and there’s a reason for that. By provoking the audience stylistically and allowing characters to create nuance to build on the foundation laid out by Goyer, Snyder successfully builds even the most minor of characters. As for Clark Ken, Kal-El, Superman, this truly is HIS movie. While a different characterization than we are used to in past films, this Superman is very well developed through the aformentioned flash backs and a charismatic performance by Cavill. Due to the story being dramatically different than Donner’s film, he is not given the ability to demonstrate the contrast that defined Reeves’ performance in how he embodied Clark and Superman in dramatically different ways that enabled us to understand how no one ever figured out his true identity. I loved this aspect of Donner’s movie but I don’t miss it here because this movie isn’t trying to do that. Cavill is the first time I’ve felt like I was looking at Superman when he donned the big S. Cavill must also be praised for his ability to carry this character with minimal dialogue, something Routh failed to do for me. He is allowed to lend contrast in his performance in another manner, however. His teenage scenes are effective in such a way that I want to find out if they digitally heightened his voice to give the illusion of youth or he did it. He is also especially fantastic in a climactic scene that forces him to show heartbreak as to all he has had to do to save Earth. Speaking of the climax, I’ll keep it simple. The film provided the stakes that something like the Dark Knight Rises and the Avengers lacked. There is a genuine sense of danger for the civilian population (seeing them die does indeed go a long way) and the people involved. Seeing Superman fail to save everyone and the destruction that Zod (Shannon is awesome as always.) brings to the table really gives the impression of Earth’s impending doom. Last night, I was watching the Dark Knight Rises and a fight scene with Batman. I really like this movie but it seemed amateurish in comparison because Nolan simply lacks Snyder’s eye for action (though Nolan is the far better story teller). This is the first time I’ve ever felt like I was truly witnessing Superman fight. In Superman 2 is is dragged down by the technological limitations of the time. Here, it is pure, awe inspiring spectacle. Thematically, its slightly undercooked but I appreciate that it is there. Zod’s rampant utilitarianism is a fine match to Superman’s deontological valuing of everyone’s lives is not fresh thematic material but it is very fitting. I also found how it touched upon a nature vs. nurture debate, through the juxtaposition of Zod doing what he was made to do and Superman finding new meaning through his rearing by the Kent’s. Despite it’s lack of probing these depths they are also explored in a manner I appreciate: Not hammering me in the face with dialogue reminding me of these themes but rather allowing the actions for the character to provide the material for examination. I loved this movie. It is one of the best comic book films ever made and is my favorite origin story. I have often longed for films to push these characters to limits that we rarely see them placed in inside their original comic book forms and this film provided that. The execution of Zod is one of the more powerful and fascinating takes on an established character that I’ve seen. It also provides a basis for the next film in how Superman could develop his “never kill again” mentality as well as his need to rebuild Metropolis. Is it perfect? Absolutely not. But I have rarely seen a modern summer blockbuster as fearlessly ambitious, finely executed, and… well… Epic. I eagerly anticipate the sequel. This entry was posted in Action, Sci-Fi & Fantasy, Uncategorized. Bookmark the permalink.